This is what I overheard in the fitting room area of my local Target store last Saturday. Perhaps I’m missing an opportunity to create the next viral YouTube sensation. “She said she found them in the clearance bin. But she also said ‘don’t show daddy the pink tag and everything will be ok'”. “Well, what the hell ever. Do NOT try them on”. Full disclosure – only one of these conversations was courtesy of the Rice family. I’m so glad we are showing some improvement in our behavior. So, can you guess which conversation was ours? 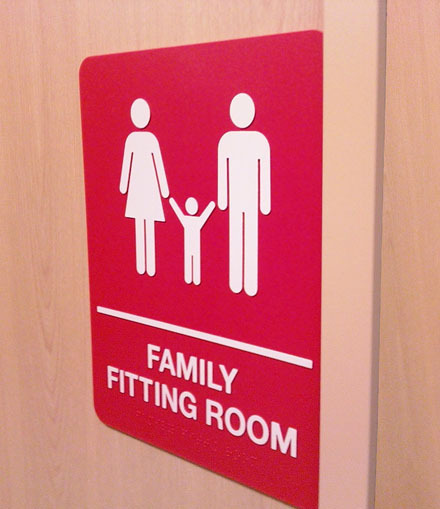 Categories: Family, Kids | Tags: fitting room, humor, shopping, Target, YouTube | Permalink. I wish that was my comment. Truthfully (and not my shining moment), it was the one about the snow pants. What’s the difference in girls and boys snow pants anyway? Will they keep the kid warm and dry…then the snow pants will work. The only difference I could see was a pink tag. Pink price tag, that is.